Big Brother Naija Housemate Cee-C has a protective sister. 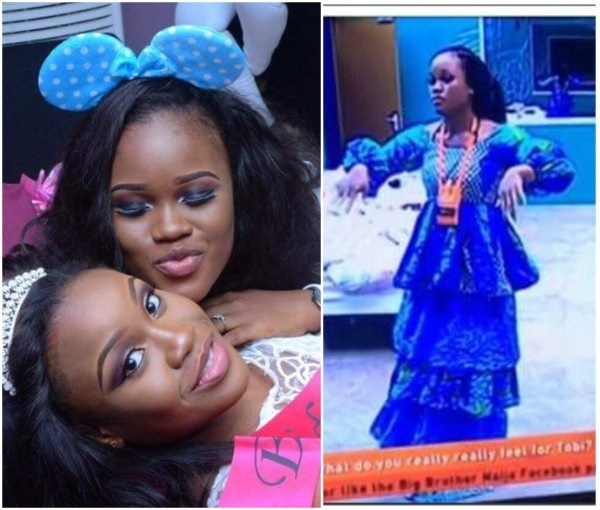 Cee-C's sister, Vanessa, has spoken up for her sister for the second time. After jumping to her sister's defense, when 'haters' called Cee-C a 'Witch' and 'Bipolar', she is now trying to explain some irrational deeds. Also Read:#BBNaija: Cee-C Knows 2 Evicted Housemates Are Returning!? She is trying to salvage another situation that seems to be getting out of hand. Cee-C sparked controversy after she ripped apart a gown, given to her by Payporte for the Saturday night party, and the online store expressed their disappointment at her action. Cee-C also said that it was “a waste of time and cloth by the tailor”. Vanessa apologized to Payporte and the entire Efik people on her behalf. According to Vanessa, she’s apologizing over the rather unnecessary statement, that Cee-C made about the attire given to her by Payporte. See Payporte's disappointment, and Vanessa's apology. Since last night it has been all tension following the readjustments Cee-C made to the clothe given to her. . It has also been a tough decision to make on what step I should take knowing that this incidence occurred inside the House and Cee-C is not here to speak for herself. But nonetheless I will make a statement on the capacity of her sister. . I want to apologize for the rather unnecessary statement that Cee-C made about the attire given to her by @payporte. . I'm not there with them as all of us here. But from previous happenings, it may seem that the housemates are not adequately informed about their task of modelling these attires for the brands that make them. I guess this is why some of the housemates go ahead to make amendments to them. . It would be more effective if @payporte were to communicate their displeasure to the housemate through their usual communication medium so that Cee-C would make an apology of her own which would be seen as more authentic, genuine and personal than what I have shared here. . That said, I apologize on her behalf and also to the Efik ethnicity who may have felt slighted by this. I assure you it has nothing to do with tribe. We love, relate and do business amicably with all tribes and people. . . Thank you. PayPorte is very dis-pleased by the comments made by @ceec_official about the outfit given to her. We take out time to style all housemates with respect to the theme of every Saturday party. We consider this a disrespect to our brand and consider this offensive.